breckenridge | brian habbe | life .. 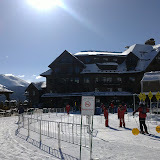 This past weekend we headed to Breckenridge, CO for a little R & R and some boarding for me. We got in late on Thursday evening as my sister and her family were already at the condo… they came in on new years day. Friday morning it was out to the slopes by 8:30, we had scheduled a private boarding lesson with the resorts Ski and Ride Program. It was just the three of us myself, brother in law and my nephew. It was a good day and well worth it, even though I had to take a conference call for about an hour in the morning. That evening we headed to the Breckenridge Brewery for dinner, nice atmosphere and good eats. Saturday it was just two of us on the slopes as the others had enough already. So armed with new knowledge on boarding I took off to the blues, after a one shot down the greens, to hone my skills. We headed over to Peak7 in hopes it wouldn’t be a busy and get some protection from the wind. It didin’t take long for me to realize my technique needed a bit of work. A few runs and a few spills later I was ready for lunch and maybe calling it a day. So we headed over to the base of Peak8 and I knew when I got there I was done. Problem being we had to get over to Peak9, that’s where the condo was. So one last run up the Mercury lift and over to Peak9 base, I’ve never been so fatigued before … ever !!!. Sunday morning came soon enough and we all headed back to Denver. Their was a big storm coming and it was reported to start at 12:00am on Sunday but it didn’t start snowing till 6:00am. By the time we left at about 10:00am their was already 4 to 5 inches on the ground and the prediction was 1 to 2 feet. Traffic from Denver on I70 was packed with skiers coming up to take advantage of the new snow. I’m sure if you live out there your use to the conditions I remember back in IL it could get bad but that’s been a few years. We did at least take some picks on the way back, here’s the feed. We visited with some friends and watched the Titans playoff game, then it was off to the airport for a late flight. Back home at 1:00am Monday, made for a short day yesterday. A good quick trip none the less and the cold I caught on Saturday has left just as quickly as it came on, which is good as I’ve got a bit of hockey this week.